The Statue of Liberty (Liberty Enlightening the World) is a colossal neoclassical sculpture on Liberty Island in New York Harbor, designed by Frédéric Bartholdi and dedicated on October 28, 1886. The statue was a gift to the people of the United States from the people of France in recognition of the friendship established during the American Revolution. Over the last 120 years, the Statue of Liberty has become an internationally-recognized symbol of freedom and democracy. 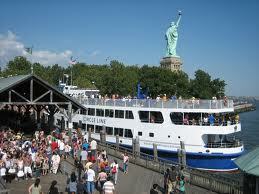 The Statue of Liberty is the most visited tourist attraction in New York. It is also the most well known place in the world. At the time of the Statue of Liberty's dedication, she was the tallest structure in New York and the tallest iron structure ever erected. Its design and construction were recognized at the time as one of the greatest technical achievements of the 19th century, and, when finally dedicated a decade later, it was hailed as a bridge between art and engineering. Lady Liberty remains the visual and spiritual center of New York Harbor. The United States of America is a large country in North America, often referred to as “the USA”, “the U.S.”, “the United States”, "America", or simply "the States". It is the third largest country by land area and by population encompassing 3.79 million square miles (9.83 million km²) and over 300 million people, consisting of 50 states. The United States of America - "Land of the free, home of the brave” - is a nation of immigrants. With its history of mass immigration dating from the 17th century, it is a "melting pot" of cultures from around the world. The United States is largely regarded as the world's wealthiest and most powerful nation. The country is also known as a “tourist’s paradise”. It is one of the most popular destinations on the tourist trail, attracting over 50 million travelers each year with its wide array of popular tourist destinations and the Statue of Liberty has always been one of them. 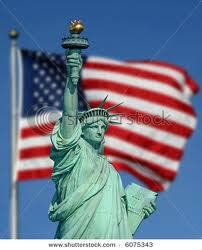 More than that, the Statue of Liberty is the symbol of the USA. Construction of the Statue began in France in the year 1875, by young French sculptor Frédéric - Auguste Bartholdi. Engineering of the structure's assembly was done by Gustave Eiffel, who later built the Eiffel Tower in Paris. The Statue was completed in France in July 1884. In transit the Statue was dismantled into 350 individual pieces and packed in 214 crates. The Statue arrived in New York Harborin June 1885. The pedestal was designed by architect Richard M.Hunt in 1877 and final assembly of the statue & pedestal was completed in 1886. On October 28, 1886, President Grover Cleveland accepted The Statue on behalf of the United States and said in part: "We will not forget that Liberty has made here her home, nor shall her chosen altar be neglected". The statue was administered by the United States Lighthouse Board until 1901 and then by the Department of War. In 1937 the responsibility for the statue transferred to the National Park Service where it has been ever since, and in 1956 the name of the island the Statue of Liberty stands on (Bedloe's Island) was changed to Liberty Island. In 1984, UNESCO recognized the Statue of Liberty as one of the World Heritage Site. In 1984, the statue was closed to the public for the duration of the renovation. 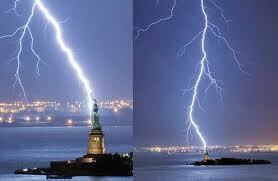 During the renovation, Lady Liberty received a new torch because the old one was corroded beyond repair. 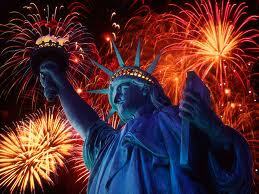 July 3–6, 1986, was designated "Liberty Weekend", marking the centennial of the statue and its reopening. On July 4, 1986, the biggest fireworks show ever in the history of the United States was set up in New York City Harbor to celebrate her centennial. After the September 11 attacks in 2001, it was closed for reasons of safety and security; the pedestal reopened in 2004 and the statue in 2009, with limits on the number of visitors allowed ascending to the crown. The statue is scheduled to close for up to a year beginning in late 2011 so that a secondary staircase can be installed. The idea of the Statue originated around 1865 with Edouard de Laboulaye who saw the United States as a country that had proved that democracy was a viable type of government. De Laboulaye also saw the gift as a way to reflect his wish for a democracy in France. Artist Frederic-Auguste Bartholdi, who was known for large-scale work, was commissioned to design this sculpture. Nothing happened for some time, but finally in 1874 Bartholdi came to the United States to look for a location for his monument. He saw Bedloe's Island from his ship as he sailed into the New York Harbor, and realized it would be a perfect location - since here his statue would always have an audience. The poem was so moving it was inscribed in bronze on the pedestal of the statue in 1903. The Statue of Liberty is New York City's most iconic landmark and a must-see stop for anyone visiting New York City, as it is one of the most iconic elements to the Big Apple. The Statue of Liberty has been around for over 120 years since it’s dedication in October 1886 and continues to stand tall as a symbol of freedom all over the world. The Statue of Liberty is one of 20 World Heritage Sites located in the United States. Each year, more than 4 millions tourists go to New York City and see the Statue of Liberty - one of the sculptural masterpieces of humanity. The Statue of Liberty is literally the biggest woman in America, as in any other part of the world too, standing tall at 46 meters. Add another 47 meters for its base and the foundation, the total length till the torch tip is a massive 93 meters - the height of a 22- storey building. The total weight of the statue is 225 tons. The Statue of Liberty is made of red- brown copper, after over 120 years, color of the statue now turned green. Visitors can take an elevator or climb 192 steps to an observation deck at the top of the pedestal and have a great view of the New York Harbor skyline. A museum located inside the pedestal gives full detail of the history of the monument and features the original torch and flame. The Statue of Liberty Exhibit is located on the second floor of the pedestal inside the Statue, and features a vast collection of photographs, prints and artifacts that tell the story of the monument throughout history. The full climb of 354 steps take the most ambitious visitors from the pedestal to the crown, offering breathtaking views of New York Harbor and New York City. On the crown of this statue, there are 25 windows, the symbol of the precious which were found on Earth. In addition, seven rays in the crown represent for light enlightening seven ocean and seven continents in the world. Inside the right arm holding the torch also has a steel staircase with 42 steps, connecting from the top of the spiral staircase at the top of statue to the torch. Arm of the Statue of Liberty is 12.8 meters length. The torch, the symbol of the flames which is always lit- the flame of hope, is plated by gold. Power used to light the torch is 16,250 watts every day. The statue had a lighthouse keeper and an electric light that could be seen for 24 miles. Visitors can learn about the history of the famous torch held by Lady Liberty by visiting The Torch Exhibit which is located on the second floor balcony of the statue (the Statue of Liberty's original torch is now on display at the monument's museum). Statue’s left hand gripped the Declaration of Independence of the United States- a political document was declared on April 7, 1776. The Declaration upholds life liberty and equality. It is the close meaning with the Statue of Liberty. Lies at the feet of the statue are a broken iron chain, impaling for the history to overthrow the rule of brutal forces. It is an arduous struggle to achieve freedom and independence. The statue not only represents the aspiration for freedom of American, but also of mankind throughout the world. There’re so many choices for visitors to enjoy their trip to the Statue of Liberty. If you want to know more about the history of the monument, visit the Statue of Liberty Exhibit orwatch a short documentary about the making of the Statue of Liberty at the Visitor Information Station. To satisfy your curiosity, there’s also a tour for visitors to view the Statue of Liberty and see the interior framework of the statue up close, and learn about the statue's design (all these ranger-guided tours at the Statue of Liberty are free). Even if you don't want to take a self-guided tour of Liberty Island, you can still take an audio tour that will take your around the key attractions and sites on Liberty Island, and also walk you through the monument (tours are available in several languages). Visiting the Statue of Liberty’s not only interesting but also inexpensive. The only costs to enjoy the Statue of Liberty and everything on it are the price of the ferry ride to get to Liberty Island. Except for an additional $3 if you want to check out the crown of the statue, everything else on the island that you may want to check out is free. So don’t miss the chance to see this “sculptural masterpiece of humanity” yourselves. Visiting the Statue of Liberty is extremely popular with travelers coming to New York City, especially in the summer (during the months of June through September). So to avoid long lines for the ferry (which are longest on summer weekends) to Liberty Island, try to plan your visit during the week and catch the first ferry of the day (the first boat departs for Liberty Islands at 9 0 A.M; the last boat off of Liberty Islands is at 5:00 P.M, from Ellis Island at 5 0 P.M) but still prepare yourselves for over an hour wait. Always arrive early and allow plenty of time for your visit (at least 2-3 hours for the Liberty alone and 5-6 hours if you also want to visit Ellis Island). Make your reservations for "pedestal ticket" or to access the crown of the Statue of Liberty early during the summer and holiday periods. "Pedestal ticket" holders will be able to enter the Museum Gallery and visit the top of pedestal. Lockers, for small items, are available at Liberty Island for rent ($1 for 2 hours) since only small purses and camera bags are allowed (and will be inspected) inside of the Statue of Liberty. Keep in mind that there is no eating, drinking, or smoking inside the National Monument. Respect wildlife at the National Park. Do not feed any wildlife that you may encounter at the park. There is plenty of space for enjoying a picnic lunch on Liberty Islandso bring along a picnic lunch of snacks to avoid the lines at the concession stand (as well as the overpriced, fairly mediocre food). In the summer, prepare yourselves for the sun by bringing sun block and water. Please note: Liberty and Ellis Islands are open daily (from 9:00 A.M to 5:00 P.M) except December 25th (Christmas Day).